I was almost going to give this one a pass. I had been seeing a lot of superhero movies lately, and superhero movie fatigue was beginning to set in. These Marvel movies all tie together, so you kind of have to see them eventually just to be all caught up on the continuity. And I knew if I didn't see it in the theaters, I'd eventually end up seeing it on the small screen (like I did with Age of Ultron). So might as well see it in the theater. Then all those reviews started coming in. People were really raving about this movie. And then I absolutely had to see it. I suspect my expectations leading into this movie were similar to most people. But correct me if your experience differed from mine. 1). This is just going to be one of those little Marvel movies to tide us over until the next Avengers crossover. 2). Wow! Everyone's raving about this movie. It's supposed to be the best Marvel movie ever! People were calling it Marvel's first Shakespearean epic. People were calling it the next evolution of Marvel movies. 3). And then the counter-reaction set in. A lot of people started posting on the Internet something along the line of: "It wasn't a bad movie, but it's nowhere near as good as everyone's been saying." ...put me in group 3 right now. It wasn't a bad movie, but it was nowhere good as everyone has been saying. But let's get in to the positives first. * The acting is great. The actress who plays Shuri (Black Panther's sister) was also great. And, as much as I hate to be the guy who praises the only two white characters in the film, both Martin Freeman and Andy Serkis were great. I love Martin Freeman's comic facial expressions. (That look of exasperation he had when he was talking to Andy Serkis was great). And Andy Serkis was just amazing! * This movie definitely solved Marvel's villain problem. * The movie avoids the temptation to focus in only on the hero, and makes this movie a real ensemble cast. It wasn't just about the Black Panther, it was about the whole leadership of Wakanda. * I know people always hate that the Marvel movies are always setting up future movies. It's an interesting system Marvel has of doing the old set-up and pay-off across movies rather than within a movie. It's annoying when you're watching the movie with the set-up. But it is kind of satisfying when you get to the pay-off. Andy Serkis and the Vibranium was one of my least favorite parts of Age of Ultron. But it was kind of nice to see that plot thread now paying off in Black Panther. * Severe pacing problems. Especially in the first act. Too much standing around and talking about how great Wakanda is. There was some action sequences in the beginning, which were intended to break-up the exposition, but I actually found them just as boring as the talking (I think because I didn't really know who the people were, and the stakes were not clear.) That whole challenge fight scene at the beginning had me confused as to what the point was. In fact that whole "becoming King" ceremony followed by the "becoming King Vision" ceremony of act 1 was way too long and boring. * Why are they constantly switching back and forth between Wakandan and English. If you want to have them speaking Wakandan to build the illusion of authenticity, go for it. And if you want them to just speak English, then go for it. But what is with all that switching back and forth? * A lot of these Marvel movies have suffered from the problem of having undefined powers, or undefined magic technology, that just works when it is convenient to the plot. This movie has the "undefined magic technology" problem in spades. I know progressives, and people of color, seemed to have embraced this movie. 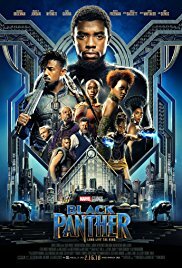 But during those opening tribal ceremony scenes, I couldn't help but think to myself that this movie was using every African tribe stereotype in the book. It was almost like watching one of those jungle adventure movies from the 1930s. Would you call this racist? Well, you wouldn't, would you? Because the writers are both black, and the director is black. It made me think a bit about how the stereotype itself isn't as important as the intention behind it. It also made me think a bit about how almost all visual representation on film is some kind of stereotype. Even films or dramas that are supposed to be based on real life make use of stereotypes. For example 90201 Beverly Hills is nothing like a real American high school. It's a stereotype based on our images of what a typical American high school is. I liked it a great deal, but also think the accolades are a bit much. I mean, geez -- it's a proficient comic book movie. With strong African characters, strong African women characters, sure -- so what's really been accomplished, narratively, is everything the culturally-sensitive types (whom I hope to count myself among) have been saying and lobbying for can work in the comic book template. We take our progress where we get it, I suppose. Oh: Michael B. Jordan is a talent worth combing the archives for. He had the goods from a very young age, providing the tragic moral centre as Wallace in The Wire and moving on to take the final seasons of Friday Night Lights to a close (digression: never thought I'd be a guy who unreservedly recommends a TV show that revolves around a Texas high school football team -- but I am that guy (just skip season 2)). MBJ even makes Creed worth the watch, actually. So, I actually have seen The Wire. (My review here here . And I realized Michael B. Jordan was Wallace after I had already finished writing the review. But I decided not to change it. I figure child-actor Michael B. Jordan doesn't really count as having seen adult Michael B. Jordan. And to sneak that qualification into the review would have made it a bit clunky, so I just left it out. But...yeah... interesting that Wallace from The Wire would grow up to be such a talented actor, huh? I've never seen Friday Night Lights or Creed, but I'll take your word for it that MBJ makes them watchable. Hopefully we'll be seeing a lot more of him in the future. He really did a great job in Black Panther. And don't forget Creed. Great acting from MBJ, but also terrific cinematography. His first fight in the ring is a tutorial on how to maximize emotional power with single-take scenes. Oh, wups -- you said "Creed" my bad. Tangentially: the trailer for Solo played at our viewing of BP. Wow, did that ever get a "meh" from the crowd. Had to admit that even the next Mission: Impossible installment looked exciting when it played immediately thereafter. I actually thought the trailer for Solo looked pretty cool. I had been hating the idea of it before I saw the trailer. But now I'm cautiously optimistic. Haha! Beastie Boys improve everything, it seems.